Over 30 Gourmet Flavors to choose from!! ~All of our cake pops are freshly made to order. Please allow 3-4 days for your pops to be made, as we bake and decorate all orders from scratch. Each cakepop is individually wrapped and ties with a twisty tie. Custom created pops or large quantity orders may require additional time so please include the date you need your pops by when your order is placed. If you need your items within days of your event a rush fee may be added to your total depending on the circumstances. ~ALL Cookie Orders and Specialty Cakepops REQUIRE A 14 DAY lead time! The Texture of Cake Pops and Why Ours are Different! 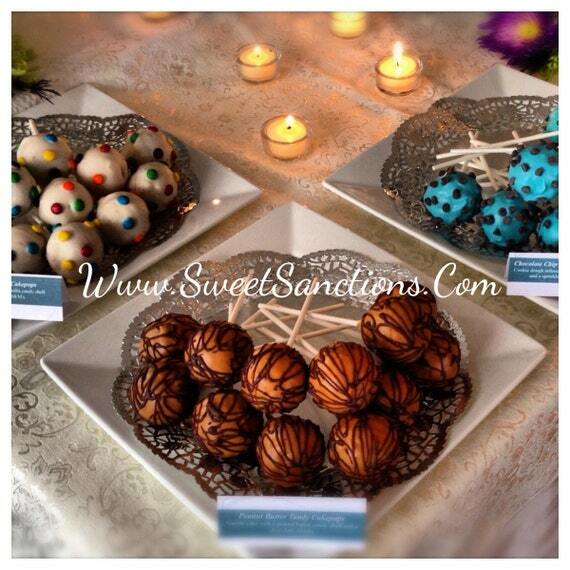 Sweet Sanctions cakepops are baked FRESH with Real Cake!